Wong Keong Fook's self-made success in the seafood business is testimony to his two decades long of sheer hard work and determination. From his humble beginnings in freshwater fish farming, Wong has emerged as possibly Malaysia’s biggest seafood importer, wholesaler and owner of the popular Unique Seafood restaurant in Petaling Jaya, Selangor. Wong started his seafood importing business started when the restaurant and hotel industry customers asked him for more variety in his seafood supply besides freshwater fish. Using his experience and aquaculture expertise, Wong began procuring fresh, live and unusual seafood from overseas to fulfill the industry demands. Today Unique Seafood is the most notable supplier in town that offers the widest, freshest and most distinctive variety of imported seafood – not only to industry players but also to ordinary seafood lovers. With three restaurants in Malaysia, one in Singapore and another in Jakarta, Indonesia, Unique sells prized catches of fish, crustaceans and shellfish at reasonable prices. The Unique Seafood Restaurant itself is quite a draw in itself – diners are presented with a cornucopia of fish, clams, crabs, lobsters, molluscs and other exotic edible underwater denizens to choose from, kept in ascending rows of huge glass display tanks. The ambience is akin to that of a bustling seafood market where customers can watch their preferred catch being weighed, cleaned and cooked to order as part of the restaurant’s open concept. Lest you think dining at Unique Seafood is only for the rich, Wong is savvy enough to dispel this misconception by offering something to everyone, whether they are young or old, rich or middle class, corporate or family, seafood lovers or not. Consequently, the outlet offers pocket-friendly value lunches (RM48.80++ onwards) and set dinners (RM398++ onwards) for the budget-conscious. You can even enjoy their daily dim sum at 50 percent discount. In view of rising prices and everyone feeling the pinch on their pockets, it can still be viable to dine at Unique Seafood. Just opt for one or two indulgent seafood specialities and supplement your meal with other more affordably priced dishes. For those where money is of no object when it comes to savouring King Neptune’s treasures, the Fried Boston Lobster with Garlic and Cheese (RM138 per kg with RM30 cooking charge) is highly recommended. Apparently this price is unrivalled anywhere else in the Klang Valley. The king of shellfish certainly lived up to expectations – the flavourful cheese sauce, subtly imbued with minced garlic is light enough for us to discern the lobster’s freshness and naturally sweet flavour. Unique’s signature preparation of braising seafood with golden superior stock is equally outstanding. A concoction of carrot juice, dried scallop and superior chicken stock, the splendid sauce certainly emphasizes the Alaskan King Crabs’ inherently clear, sweet taste. At the current promotion price of RM178 per kg (normal price at RM208/kg), it is by no means cheap but if you want a seafood dish out of the ordinary, this crab is worth its weight in gold. The one we had weighed a hefty 2.2kg so whilst one half was Braised in Golden Superior Stock, the other half was Baked with Salted Egg. Needless to say we thoroughly enjoyed every bit of this delectable dish – from the rich, gritty salted egg yolk coating on the carapace to the chunks of stringy yet succulent flesh of this gigantic crab. Personally I found the Deep-fried Shredded Ginger and Oyster Sauce topping for the South African Abalone (RM24.80 per pc) a tad overwhelming. I presume the combination was intended to temper the abalone’s overly fishy flavour but in this instance, the ginger, oyster sauce and shredded spring onion were too overpowering for this delicate gastropod. The humongous Baked Canadian Oysters with Cheese (RM7.50 per pc) were sinfully indulgent and impossible to devour in a single mouthful. Fortunately, the molluscs remained sweet and succulent on the palate in spite of the melted cheese on top. Our only non-seafood dish for the evening was Fried Kailan in Two Styles – the leafy part was finely shredded and deep-fried, rendering them crisp and crunchy. Topped with some tiny silver anchovies, they provided good textural contrast with the tender, stir-fried kai lan (Chinese kale) stalks. 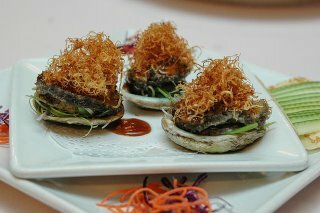 Non-seafood dishes are just as extensive and varied in the menu. Honey lamb chops, ostrich in black pepper sauce, venison in Unique sauce, noodles and rice dishes are tasty options to consider and will appease those who want some balance and variety to their meal. The restaurant also has a selection of fine wines available but should you decide to bring your own wine, there is no corkage charge. Wong assures us that diners will always have the option of more affordable seafood such as Red Tilapia, blood cockles and kepah (local clams) besides more exotic and luxurious items of Scottish razor clams, Australian rock lobsters, French turbot, rainbow grouper and Canadian geoduck clams. Cooking styles vary with prices hovering around RM30 and above. With such careful considerations for customers, is it any surprise that Unique Seafood Restaurant was recently voted by readers of a Klang Valley-based magazine as their ‘Favourite Seafood Restaurant’?